Abandoman aka Rob Broderick creates hilarious musical sketches at lightning speed live in front of his audience. No two gigs are ever the same! 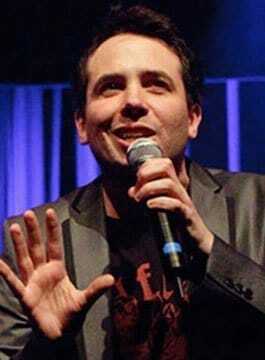 The project sees comedian Broderick reinventing hip hop in a way that appeals to all age groups. Winner of the Hackney Empire New Act of the Year, Musical Comedy Awards and the Adelaide Fringe Festival “Best Comedy – Newcomer” award, Abandoman creates musical songs and sketches at lightning speed based on audience interaction. Come to the show, drop your suggestions in the ring and watch as Abandoman makes musical magic. The last few years have seen Abandoman tour with multi-platinum artist Ed Sheeran, headline comedy stages at every major UK music festival (including Glastonbury, Latitude, Bestival, Leeds & Reading), host London’s St Patrick’s Day event to over 15,000 revelers in Trafalgar Square, and be named out of over 2000 acts as the Sunday Times’ “Best Musical Act” of the Edinburgh Fringe Festival 2014. Abandoman performs extensively in both the UK and abroad. Including sold-out runs at the Adelaide Fringe Festival, and shows in Hong Kong, America, and numerous destinations in Europe. Abandoman has appeared on 8 Out of 10 Cats Does Countdown, The Al Porter Show (RTE), The Ray D’Arcy Show (RTE), BBC3′s Live at the Edinburgh Fringe Festival, BBC2′s The Stephen K Amos Show, on Sky Arts as part of their Latitude coverage and many radio shows, including BBC Radio 1′s Fun And Filth Cabaret, alongside Paloma Faith and Nick Grimshaw. Abandoman is favourite on the comedy, music and corporate circuits on account of Rob’s ability to interact with an audience in an unparalleled fashion. Watch your guests be turned into heroes, and watch the astonished faces of their peers as never-to-be-repeated songs captivate and enthral the crowd. "Killer punch lines. Note-perfect, lyrically mind-blowing hip-hop improv. Genius!"